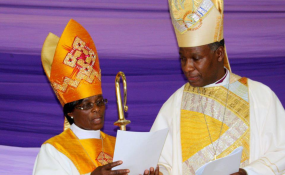 Cape Town — The Anglican Church of Southern Africa has consecrated the continent's first woman bishop. The Revd Ellinah Wamukoya was made bishop of Swaziland during a service in the deeply traditional kingdom last weekend. She was elected bishop by clergy and lay representatives of the diocese earlier this year. Women were first ordained as priests in the Anglican Church in Southern Africa 20 years ago. Within months of Bishop Wamukoya's election, another woman, the Revd Margaret Vertue, was elected bishop of the Diocese of False Bay, which is centred on the town of Somerset West, outside Cape Town. The church has been ahead of its mother church, the Church of England (CoE) , both in ordaining women as priests and in making them bishops. The CoE this week faces a crucial vote on whether to allow woman bishops.